Keynote Speech by H.E. 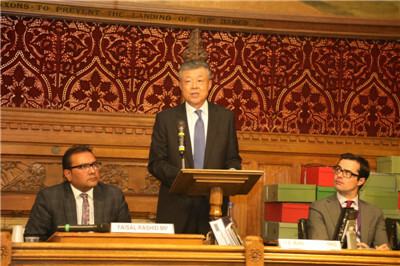 Ambassador Liu Xiaoming at the Launching Ceremony of the All-Party Parliamentary Group for the Belt and Road Initiative and China-Pakistan Economic Corridor: Share the Opportunities of the Belt and Road Initiative and Create a Splendid Future for the China-UK "Golden Era"
It is a real delight to join you to launch the All-Party Parliamentary Group for the Belt and Road Initiative and China-Pakistan Economic Corridor. I would like to begin by extending my warmest congratulations on this brand new APPG. This year marks the fifth anniversary of the Belt and Road Initiative. Over the past five years, the BRI has carried on the spirit of the ancient Silk Road and yielded fruitful results. The connectivity over land and at sea along these routes has been greatly improved. 103 countries and international organizations have signed 118 cooperation agreements with China on the BRI. This Initiative and its core values have been endorsed by important international mechanisms, such as the UN and G20, in their documents. Today the sentiments of anti-globalisation, unilateralism and protectionism are surging in some parts of the world. The BRI is following the mainstream trend of the times by advocating dialogue, consultation, joint contribution, shared benefits, win-win cooperation and mutual learning. It opens new prospects for the development in the world. It offers new ideas for the reform of the global governance system. It is a new platform for the new round of economic globalisation. It is against this background that the APPG for the BRI and CPEC is established. I think this is both timely and significant. Why has the BRI become so popular in just five years? What does the BRI mean to China-UK relations? Let me answer the first question first. I believe there are three reasons for the popularity of the BRI. First, the BRI is a "big family" of equal-footed members. It is a portal that is open to all. It is not a closed and exclusive "small coterie". It is committed to promoting integrated development of all economies; It rejects "zero sum game"
It is not intended to exclude or replace any one. This is an open, transparent and rule-based Initiative. Partners of BRI follow market rules and internationally-accepted practice. Decisions are made through extensive consultation. These are the reasons why the BRI has a growing circle of friends. An increasing number of countries have cast their vote of confidence and support. Second, the BRI is not a "talking shop". It is a platform for action. The countries along the BRI routes want development and prosperity. The BRI represents such pursuit. It meets the need of the people of these countries for a better life. It has delivered tangible benefits. In the coming five years, China will import $2 trillion of goods from countries and regions along the BRI routes and invest $150 billion there. Third, the BRI is a "chorus" rather than a "one-man show". It is a platform for win-win cooperation rather than a tool to "put one's own country first". The BRI is not about one country having it all to itself. It is about making the pie bigger and sharing it among all the BRI partners. In the past five years, more than 8,000 China Railway Express trains traveled between China and 43 cities in 15 European countries. These were all 85% full and delivered goods to thousands of homes in China and Europe. Early last year, China Railway Express ran its first freight train between China's Yiwu and London. Another good example is the China-Pakistan Economic Corridor. As of today, nine CPEC projects have been completed and thirteen are under construction. They include four key areas, namely, ports, energy, transport infrastructure and industrial cooperation. These projects have created 70,000 jobs directly for the local communities, and are expected to generate another 700,000 from 2017 to 2030. And they will add 11,000 megawatt to Pakistan's electricity supply in the coming years. Now let me turn to the second question: What does the BRI mean to China-UK relations? My answer is just one word: Opportunities. China and the UK are "natural partners" in advancing the BRI. UK's business experience and creative industry match well with China's efficiency and commercialization capability. Britain's Industrial Strategy and "global Britain" also coincide with the goals of the BRI. The UK has unique strengths, namely the English language, advanced international finance, mature legal and consultancy services and deep historical bond with countries along the routes. These will give UK an advantage in participating in the BRI. China-UK cooperation on the BRI promises huge potential and broad prospects. As natural partners, China and the UK are not only cultivating their matching strengths but also making solid efforts to build on these strengths. The governments of our two countries have attached great importance to our cooperation on BRI through improving top-level design and strategic planning. The British business community has also taken concrete action to engage in Belt and Road cooperation. British companies and financial institutions have carried out fruitful cooperation with their Chinese partners on financing and professional expertise and services in a third market along the routes. Among them are HSBC, Standard Chartered, BP and KPMG. The strategic consensus between China and the UK on Belt and Road cooperation is being translated into concrete actions, which are the highlights of the China-UK "Golden Era". Last month, President Xi Jinping made an important speech on the BRI. He used terms of traditional Chinese painting to describe the progress of the BRI. He said, the sketch of BRI is now done with "freehand brushwork" and it is time to attend to the details with "fine brushwork". This speech has highlighted the priorities for China-UK cooperation on the BRI going forward. We need to use our skills of "fine brushwork" to focus more on project implementation, market exploration, financial guarantee and risk prevention. The meticulous efforts will enable us to engage in cooperation of a higher quality at a higher standard with higher return. 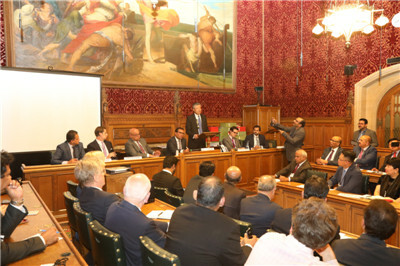 I have full confidence in and high expectations for the APPG for the BRI and CPEC. I would like to borrow the acronym of BRI to express my hopes for the APPG. First, B is for bridge. I hope the APPG will serve as a bridge of communication and bring in more British public support for and participation in the BRI. 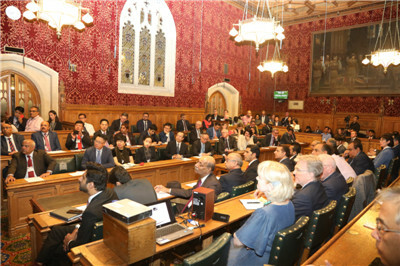 The APPG is uniquely placed to help Members of the Parliament gain a deeper understanding of the opportunities the BRI has to offer and to become supporters, participants and advocates for China-UK cooperation on the BRI. This is crucial to the implementation of the strategic consensus of our two countries on BRI cooperation. This is crucial to providing the policy support and legal guarantee such cooperation needs. The APPG could also give British think-tanks, media institutions and the general public a comprehensive and fair view on the BRI. This helps generate favorable opinions of and consolidate public support for China-UK cooperation. Second, R is for resolve. I hope the APPG will show its resolve and encourage more concrete actions on China-UK Belt and Road cooperation. With regard to CPEC, a flagship project of the BRI, the APPG should support trilateral cooperation on the basis of consensus so as to deliver benefits to all three parties. Under the current circumstances, it is also important that the APPG advocate the Belt and Road spirit of openness and inclusiveness, stand firm against protectionism and unilateralism, and uphold free trade and the rule-based multilateral trade regime. Last but not least, I is for innovation. I hope the APPG will be innovative and contribute more ideas to China-UK cooperation on the BRI. Creativity is in the genes of the British culture and has driven the progress in the UK. The APPG could encourage British companies, financial, legal and consultancy institutions and think-tanks to take an active part in China-UK cooperation on the BRI. Their wisdom and ideas would be most welcome in BRI project implementation, cooperation model, market exploration, financial guarantee, legal support and risk management. The APPG could also join hands with existing cooperation mechanisms on the BRI to maximize and magnify their efforts. "Do not let it slip when the time comes. Do not let it pass when opportunity knocks." The UK is located at the Western end of the extension of the Belt and Road. It is also an important hub on this East-West thoroughfare. China-UK cooperation on the BRI has set sail, is breaking the waves and making good progress. 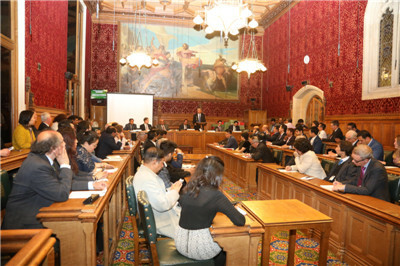 I am sure that with the concerted efforts of the APPG for the BRI and CPEC and people of all walks of life in both our countries, China and the UK will be able to seize the opportunities and work together to deliver more fruitful results for China-UK cooperation on the BRI and create a more splendid future for the China-UK "Golden Era"!